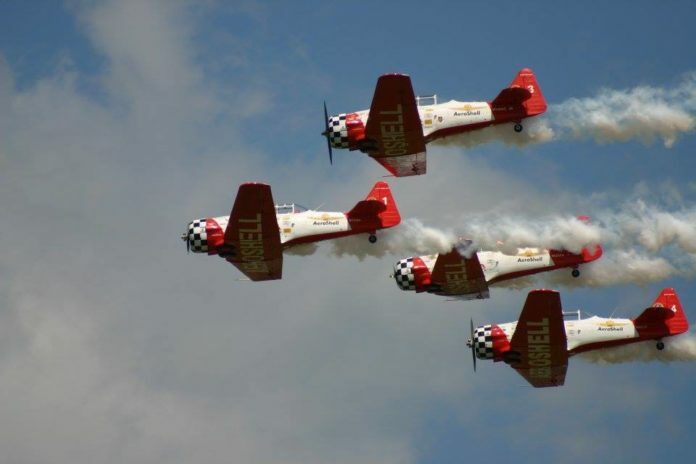 There are several things you should remember about Wings Over Natchitoches, an airshow that will land at Natchitoches Regional Airport Saturday, Oct. 14. Events and parking will be free, there’s a lineup of crack aerobatic pilots and it will be a unique and exciting event for the whole family. Gates will open at 10 a.m. to the public and the airshow will begin at noon. Wings President Mike Hilton says Platinum Level Sponsors like The City of Natchitoches and CLECO make contributions that offer free events. An added feature this year will be a free shuttle service from Natchitoches Central High School to the airport. Durham School Services will run the shuttle that will alleviate looking for a parking place. “The bus will stop at the front gate,” Hilton says of the in-kind service by the company that is the transportation services for the Natchitoches Parish School Board. The shuttle service will also be free. Hilton and another event organizer, Stanley Salter, has a particular interest in one project they created to promote the show this year. Hilton and Ben Stanfield built a wooden model to use for publicity and also to use in the children’s area for photo ops. Hilton and Stanfield were the engineers and builders and Salter and other volunteers applied the shiny red paint job. They say it represents about 30 hours of work. The first airshow two years ago drew thousands of spectators. It showcased the City airport and community in a positive way, thanks to the list of sponsors. There will be displays and exhibits all day Saturday. Velocity Care will provide a medical tent in case of injury or emergency during the show. Med-Trans will provide a transport helicopter for public view. NSU Intern Kim Voohries says Wings Over Natchitoches has worked hard to increase not only the number of performers but to increase the variety of performances the public will see. Sponsorships range in financial levels or equivalent in donated services. They are Bronze $500, Silver $1,000, Gold $2,500 and Platinum $5,000.